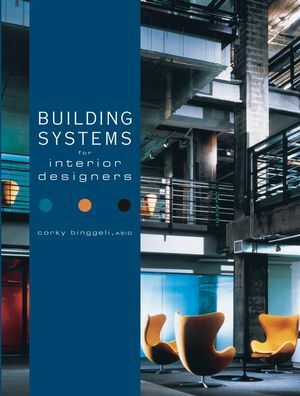 Building Systems for Interior Designers is the first book to explain technical building systems and engineering issues in a clear and accessible way to interior designers. The technical knowledge and vocabulary presented here allow interior designers to communicate more effectively with architects, engineers, and contractors while collaborating on projects, leading to more accurate solutions for problems related to a broad range of other building considerations with an impact on interior design. Information on sustainable design is integrated throughout the book, making it a relevant tool for current and emerging trends in building design. Written in a straightforward, nontechnical style that maintains depth and accuracy, this book is the first complete text applicable to interior design courses and provides thorough preparation for the NCIDQ exam. Engaging, clear illustrations support the text, which is accessible to those without a math or physics background. With numerous case examples illustrating how interior designers apply this material in the real world, Building Systems for Interior Designers is a valuable book for students, as well as a practical desktop reference for professionals. Content from this book is available as an online continuing professional education course at http://www.wiley.com/WileyCDA/Section/id-320255.html#fire_safety. WileyCPE courses are available on demand, 24 hours a day, and are approved by the American Institute of Architects. CORKY BINGGELI, ASID, is a principal at Corky Binggeli Interior Design in Boston and an adjunct lecturer at Wentworth Institute of Technology in Boston. PART I: THE BIG PICTURE. Chapter 2 Building Site Conditions. Chapter 3 Designing for Building Functions. Chapter 4 The Human Body and the Built Environment. PART II: WATER AND WASTES. Chapter 6 Sources of Water. Chapter 11 Treating and Recycling Water. Chapter 12 Recycling Solid Wastes. Chapter 14 Designing Bath and Toilet Rooms. Chapter 15 Principles of Thermal Comfort. Chapter 16 Thermal Capacity and Resistance. Chapter 18 Mechanical Engineering Design Process. Chapter 19 Indoor Air Contaminants. Chapter 20 Designing for Indoor Air Quality. PART IV: HEATING AND COOLING SYSTEMS. Chapter 26 Heating,Ventilating, and Air-Conditioning (HVAC) Systems. Chapter 27 How Electrical Systems Work. Chapter 28 Electrical Service Equipment. Chapter 29 Electrical Circuit Design. Chapter 30 Electrical Wiring and Distribution. Chapter 31 Receptacles and Switches. Chapter 35 Lighting for Specific Spaces. PART VII: SECURITY AND COMMUNICATIONS SYSTEMS. Chapter 36 Communications and Control Systems. Chapter 37 Securing the Building. Chapter 38 Systems for Private Residences. Chapter 39 Other Security and Communications Applications. Chapter 40 Office Communications Systems. Chapter 41 Principles of Fire Safety. Chapter 42 Design for Fire Safety. Chapter 46 Fire Detection and Alarms. Chapter 52 Sound Absorption Within a Space. Chapter 53 Sound Transmission Between Spaces. Chapter 55 Electronic Sound Systems. Covers building environmental systems from an interior designer's perspective. Focuses on the elements of building system design and operation that most directly affect the work of the interior designer, whether on a residential or commercial project. Takes the reader from an overview of the place of the building in the environment to consideration of each of the building's systems. Emphasis on sustainable design principles and applications.